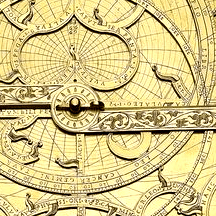 The planispheric astrolabe is a powerful astronomical calculator with a very clever design. It is composed of several fix or mobile disks, rulers and has fine scales engraved on both sides. 1 - the throne makes it possible to easily hold the astrolabe vertically when pointing a star or the Sun with the alidade. The throne on old astrolabes is usually nicely decorated and is equipped with a ring or a cord. 2 - the limb is scaled in hours and in degrees by quadrant. It gives a value when pointed with the ruler. 3 - the plate is engraved with a coordinate system suitable for a given latitude. 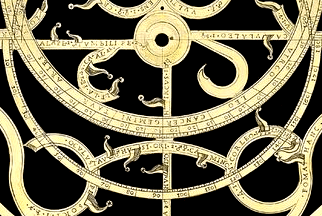 An astrolabe was usually provided with 2 or 3 plates engraved on both sides for different latitudes. The plate shows circles for tropics and for the equator, circles of altitude above the horizon and circles of azimuth, arcs of twilight and sometimes arcs of unequal hours. 4 - the rete can rotate around the axis and has pointers for the main stars. The ecliptic circle is scaled in ecliptic longitude and usually marked with Zodiac signs. 5 - the ruler makes it possible to point a value on the limb or a position on the plate. 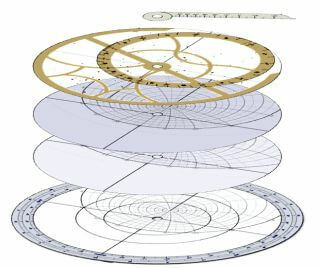 An astrolabe is a stack of elements on the same axis. On the mater (main structure), we add a plate, then the rete and the ruler, and finally everything is locked with a dowel pin. Shadows Pro allows you to print all elements to scale 1. You then glue the paper on cardboard or on wood and cut the parts according to the drawing. It is also possible to export the drawing to a CAD file (DXF or WMF) in order to drive a milling machine or an engraving machine. 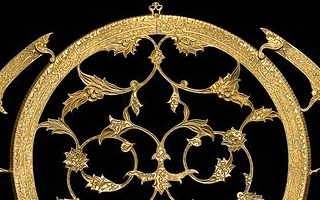 Otherwise, if you prefer not to do it yourself, visit the page » Links on astrolabes to find references of astrolabe makers which will be able to create a genuine piece of art in brass or bronze. Old astrolabes can be seen in private collections of some museums. Most of them are dated between the 13th and 19th centuries. Some are really nice objects with fine engravings and tiny sculptures on the throne. 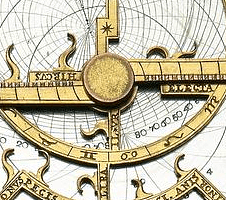 An astrolabe is an astronomical calculator. It allows the calculation of sunrise and sunset hours, hour of meridian crossing, altitude of culmination, azimuth of sunrise/sunset, right ascension or declination, and much more. 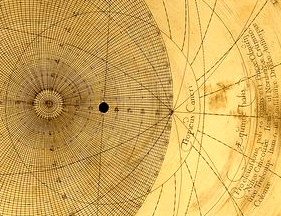 The stereographic projection, used in the planispheric astrolabe, projects a point of the celestial sphere on the equatorial plane, seen from one of the poles. For the northern hemisphere, the center of projection is the south pole; for southern hemisphere it is the north pole. 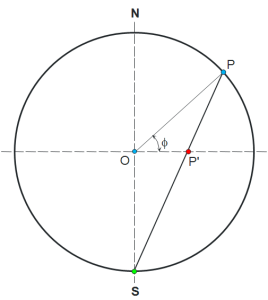 Above (left), the point P of the sphere is projected to P' on the equatorial plane. 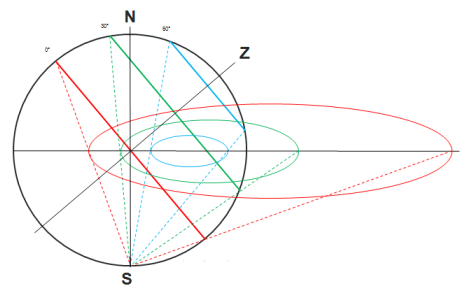 Declination circles are projected as concentric circles (equator, tropics). Altitude circles are projected as shifted circles with decreasing radii a altitude increases (right). 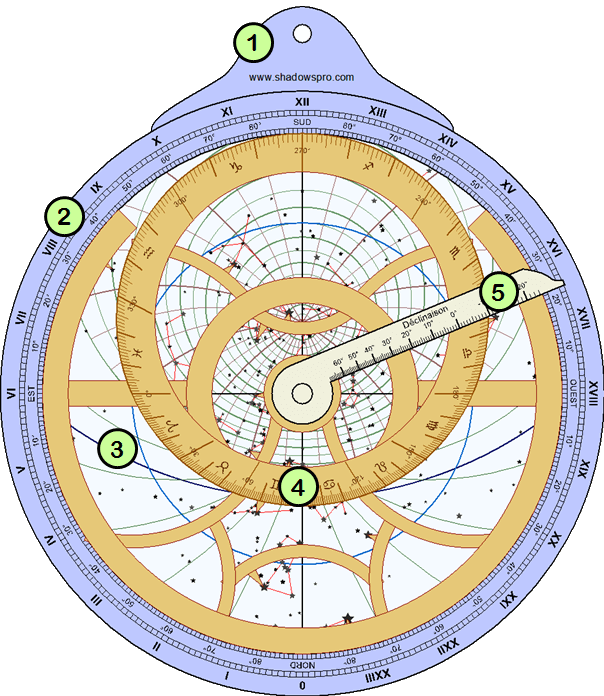 The projection is usually limited to the Capricorn tropic circle, which forms the outer circle of the astrolabe plate. 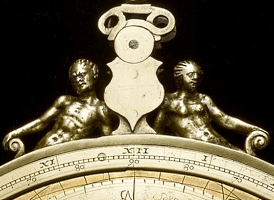 - old astrolabes: detail of astrolabes from the National Maritime Museum of Greenwich.